Do you have specific times of reflection throughout the year? For most people birthdays (even the birthdays of our children), anniversaries, and New Year's are times to look back at where we have been and what we have accomplished. They are also times to look forward to what is next, sometimes even setting goals for the future. I have noticed that extraordinary events do the same thing. It was two years ago today (October 23, 2014) that I was rolled into an operating room in Portland, OR and left that operating room six hours later with only one kidney. Several hours later Rhonda would leave that same operating room with the other kidney. That transaction changed my life. For the first year there were so many things that brought me back to the feelings of that time and experience. There were several songs that were particularly meaningful. I noticed when it was the 23rd of every month that first year. And the one year marker was very emotional. This past May (2014) our whole family did a kidney walk in honor of Rhonda. The walk was put on by the National Kidney Foundation and held at the Detroit Zoo. It was a great day to remember all our family did and sacrificed to give this gift. I love my family so much and am so grateful that they were willing to partner with me in this extraordinary gift. They were directly involved and each person stepped up in their own way throughout the process. But here is the interesting thing I am thinking about today. I am left with a craving for more of the extraordinary. My life story is not over and donating a kidney does not, by itself, equal an extraordinary life. I have passion and desire for more - more of the extraordinary journey. Just like there are adrenaline junkies, I am a bit of an "extraordinary" junkie. Sometimes the extraordinary life is loving my kids - taking extra minutes to tuck them in at night, signing up for a field trip, waiting for them after school, hugging them extra tight when they've had a rough day, or being super silly with them. These "simple" things are extraordinary and occasionally more difficult than gifting a kidney. Sometimes the extraordinary life is taking the family on a mission trip to South Africa, moving across the country, or inviting someone to join your family. A life lived in pursuit of the extraordinary is extremely difficult and even more extremely rewarding. After all the scary, exciting, difficult, joy-filled, and uncertain extraordinary living I have been blessed to do - I still want more. I have an extraordinary craving to leave this life having experienced everything God has available for me. I don't want to miss any of it. Are you living your own extraordinary journey? 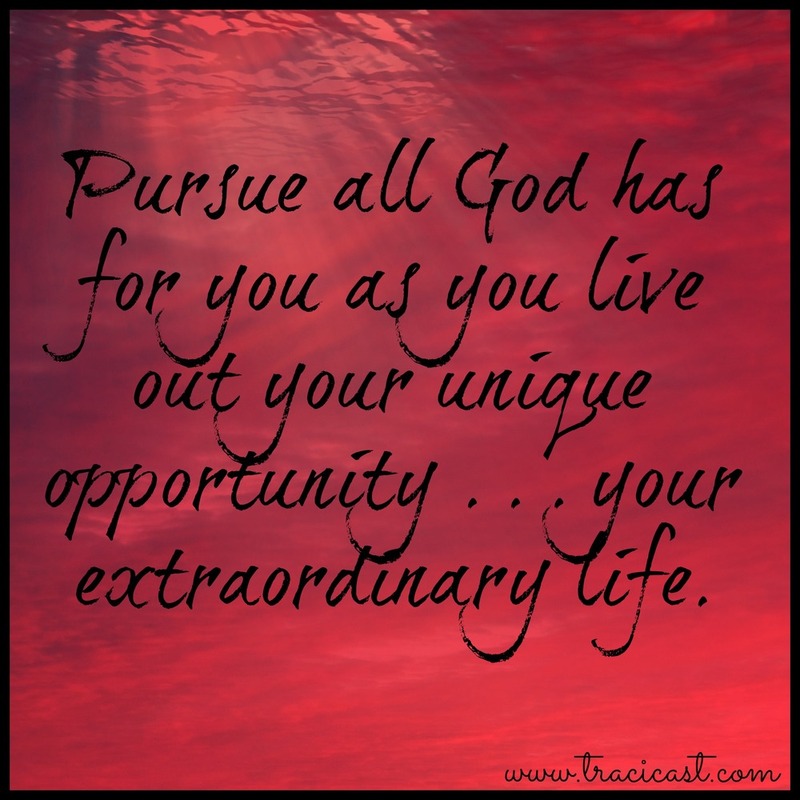 May you pursue all God has for you today as you live out your unique opportunity . . . your extraordinary life.